With Pantone‘s release Thursday of it’s 2017 Color of the Year, Greenery, (which may or may not have been inspired by the successes of the omnipresent Kermit memes this year), it’s necessary to reflect on 2016’s Color of the Year: Rose Quartz. This color was EVERYWHERE in 2016. This color and similar hues have been appropriately dubbed “Millennial Pink,” and it’s become closely associated with millennial women. The muted, blush kind of-pink pink is far from hot pink or super outwardly girly shades of pink. Rose Quartz is a much more approachable way to access pink without seeming over the top, and it has a certain element of nostalgia of ’90s youth. 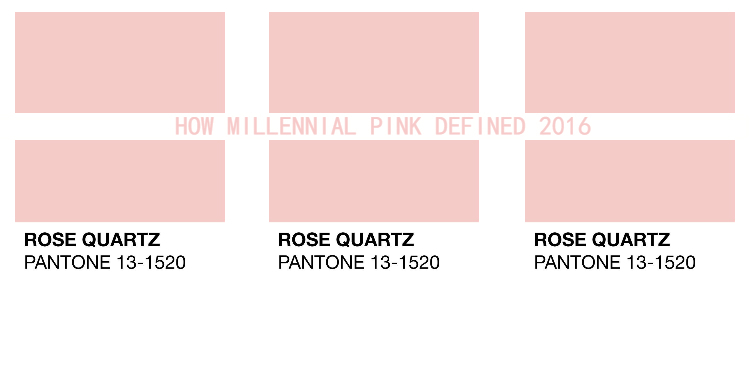 From Drake’s “Hotline Bling” artwork and the rose gold iPhone colorway to the color in almost every company’s marketing strategy, Rose Quartz/Millennial Pink seems here to stay. A #MillennialPink accessory or statement piece dress or coat is the perfect way to rock this trend. Rose Quartz was partnered with Serenity Blue, a periwinkle soft blue shade, as a way to blur the gender lines and express a mood “reflecting connection and wellness as well as a soothing sense of order and peace,” according to Pantone’s website. How do you style Millennial Pink in your wardrobe? Leave your thoughts in the comments below!